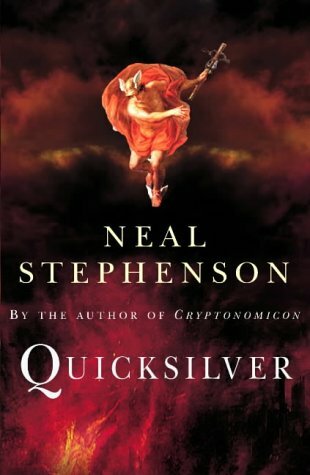 Quicksilver – Neal Stephenson « Random's 23 cents. And although the sentence refers to somebody else’s historical drama, it self-consciously echoes the structure of the novel. Which, like history, maintains only the illusion of such a structure. As some proponents of New Historicism would have it, historians and document-makers are part of the historical process they are untangling and seeking to document and explain. They are just as much embroiled in the material practices and texts of their time, as are the agents of their narratives. Neal Stephenson has built his magnificent novel around this core assumption, which has allowed him to write a book that certainly does not qualify as historical fiction rooted in facts alone, but nevertheless evokes the historical times with the vigor of juggernauts dancing tarantellas in the reader’s mental theater. Quicksilver draws its topics, characters, locales and milieus from a deep bag of research Mr. Stephenson must have filled before setting out to write. It examines, not in a strictly chronological order, events between the beheading of King Charles I of England in 1649 and an Atlantic voyage from America to England in 1713. The primary geographical vortices of the narrative include London, Cambridge, Paris, the Dutch Republic, and to a lesser extent Boston, Leipzig and Vienna. Its topics range from philosophy, mathematics and finance to war, politics and slavery. Perhaps the easiest way to capture some of this diversity without losing all pretense of focus is to do it through introducing the principal characters of the novel. 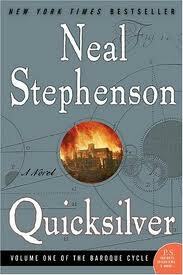 Quicksilver features many historical figures, as any blurb will be quick to let you know. Its protagonists, however, are entirely fictional, although apparently they are representative of certain types of people that were found in Europe during those times. The first part of the novel, named “Quicksilver” as well (and really just one of the eight parts that make up the baggy monster that is The Baroque Cycle), tells the story of Daniel Waterhouse (fans of Cryptonomicon will surely notice the familiar surname) – quite advanced in age in 1713, as the founder and only member of the arcane Massachusetts Institute of Technologickal Arts, and much younger at different points in the latter half of the preceding century, playing various roles in English society. Daniel is the son of one of the arch-Puritans of England, he is also at various moments a sizar to the Duke of Monmouth at Trinity College, roommate of Isaac Newton, aide to the natural philosophers John Wilkins and Robert Hooke, secretary of the Royal Society, friend of Gottfried Leibniz, confidante to King James II of England and co-conspirator with William of Orange, the Stadtholder of the Dutch Republic. Waterhouse is the perfect historian Stephenson needed to observe his own rendition of this historical period in England. Daniel is naturally timid to initiate significant actions, living in the close-to-mythical shadow of his Puritan father, sharing the belief in predestination and, well, being sort of cowardly a tad too frequently. However, in most things in life he is driven by curiosity and, with the passage of time, he is increasingly plagued by the realization that he has led an insignificant and fruitless life (foreshadowing terrible after-life prospects for your average Puritan). In Cambridge, and later in London, Daniel brushes shoulders with the brightest minds of his age, which naturally leads him to ponder fundamental questions about the generative spirit (aka God) that constitutes and shapes the world. He is a tortured man whose suffering was predetermined as early as his childhood and who suffers quietly, because as a natural philosopher (and a Puritan) he comprehends the pointlessness of desperation. Which makes his life all the more miserable, of course. This semi-scientific, semi-religious jargon is persistent in Quicksilver and through it most of its significant metaphors take off. Not a huge surprise, provided natural philosophers keep popping up throughout the book and engaging in all sorts of debates that always seem to operate on at least two levels of reference. As evidenced by the quoted passage, Daniel is the primary instrument through which Isaac is viewed, and that instrument, naturally, is insufficient to encompass the brilliance of the man. The Baroque Cycle is often described – within its own pages as well ­– as the story of the war between Newton and Leibniz for the truth about the invention of calculus, the mathematical apparatus that reshaped science, and which in this fictionalized history serves as the preeminent symbol of the Enlightenment. Due to this, Daniel is a central figure not merely in the ongoing politico-religious battle between Catholics and Protestants, but also in a titanic struggle of ideas, the outcome of which will mold the world during the future centuries. The whole book, one might argue, is one long and meandering argument about the nature of free will and how free will changes the world, shaping it according to some hidden divine principle. This argument is all-pervasive, even when the story focuses on narrative agents far or moderately removed from the intellectual arenas of Europe. Such are the other two protagonists: Half-Cocked Jack Shaftoe and Eliza, Countess de la Zeur, introduced in the second book, “The King of Vagabonds”. Through these characters the novel veers into two new directions: the carnivalesque world of vagabonds and the slippery world of international finance and political espionage. The book traces the cross-continental exploits of the eponymous King of Vagabonds, Half-Cocked Jack Shaftoe (the half-cocked part here is not some sly metaphor; Quicksilver is definitely one of the goriest works of “serious” fiction I’ve read, but the twitchiness factor ascends to a whole new level after this character tell his backstory). At the siege of Vienna he saves the beautiful Eliza, a concubine in the Turkish sultan’s harem, from death by a Janissary’s sword. Eliza is an extraordinarily gifted young woman, enslaved off the shores of the rocky Qwghlm archipelago (once again, Cryptonomicon aficionados will recognize the reference). Together with her, a fine war-horse stolen from the Janissaries (and aptly named Turk) and a bouquet of ostrich plumes, Jack sets off once again across the continent to seek his fortune. Along the way the unlikely duo passes through Leipzig where they acquaint themselves with the Doctor (no, not that one) – also known as Gottfried Leibniz – who initiates Eliza into the exciting intellectual landscape of modern Europe. The novel employs a constant translation between the matrices of the material and the mundane and those of the abstract and the arcane. Much like the metaphysical poets, who predate the events of the novel by mere decades, the author constructs increasingly elaborate conceits that, often through their vulgarity, are able to explicate complex ideas such as finance, politics and the laws of gravity. It is another way of unmasking the secret principles of existence, or the system of the world, as some characters refer to it (also the name of the third novel in the cycle). It is, furthermore, a kind of literary alchemy, derived from the historical times and fashioned for the modern reader. Metaphors involving the gods are then used to refer to the political games played in the French court, frequently in a deliberately cryptic manner to conceal the true meaning of what is being said. Cryptography itself is used as a metaphor for the way the truth of God is diffused prismatically by our own existence, which thereby obstructs this light. And this brings us back to the correct empirical measurements needed to crack God’s cryptogram. Which in turn casts a doubt upon a method of understanding that relies so much on metaphor, a notoriously unreliably tool, but one that we use ubiquitously. The Ouroborous constructed by the book is such a grand beast that it defies comprehensive measurement: it is the book itself, and as any great story defies static interpretations. To reinforce this point, Stephenson shows us a wholly different world via Jack Shaftoe. Vagabonds apparently were a massive problem at that time, gathering in great gangs, plaguing the continent and being immortalized in picaresque novels. Jack is the picaro par excellence. After Vienna and Leipzig he continues his crisscrossing of Europe, gathering infamy around the Netherlands, France and the coasts of Barbary. Some of the most hilarious parts of the book gravitate around him; he carries the aura of surrealism through his often absurd behavior. The insights of natural philosophy and Puritanism glimpsed through the “narrow embrasures” of Daniel’s mind are turned upside down in the carnivalesque procession that seems to follow Jack wherever he goes. His affliction with a mental illness that deranges him radically from time to time contributes to the Hieronymus Bosch feel there is to much of his part of the narrative. Indeed, Quicksilver is not very much bothered about novelistic traditions such as structure, linearity, consistency of form, etc. More than once the characters go to see plays which are sometimes told in dramatic form. Actual scenes from the novel are told in the same way, possibly to highlight the theatrical (often farcical) quality of history. In the third part – “Odalisque” – Eliza, now a double agent implanted in the French court, is portrayed entirely through her letters and the letters others write about her. Drama blends with historical fiction blends with the picaresque blends with the epistolary blends with the novel of ideas. High is intermixed with low, especially in the case of Jack, who at one time talks to “a disembodied candlelit head resting on a great misty dung-pile” and at another discusses the matter of free will with the greatest rat catcher of Paris, trying to convince him that, just maybe, it is the rats who breed and condition him, not the other way round. This is the character who symbolically embodies the mercurial flux (and indeed, one of his nicknames in the subsequent installments of the cycle is Quicksilver). Because of that he is also the one that provides the most immediate sort of readerly entertainment. The last protagonist, Eliza, is just as interesting as the first two. She is a financial genius, a natural-born diplomat, stunningly beautiful, well-versed in the art of love, and yet a virgin; also a spy and possibly one of the first abolitionists. It sounds absurd when you read it packed in a single sentence, but read the book and you will fall in love – either with the character herself or with the way she comes off as fully believable in the context of the novel. It is funny how although Eliza is a woman, her perception of “the system of the world” is much keener that either Daniel or Jack’s. Her story introduces us to a number of fascinating historical figures, among which are King Louis XIV and William of Orange – the two titans, whose clash for European supremacy is symptomatic of the deeper change the continent is undergoing at the time. The metaphor, as all the rest of them, is further elaborated to paint a bleak and yet somewhat reassuring picture of the universal human condition. It also, incidentally or not, paves the way to one of the greatest action scenes I have read in the last few years. I won’t spoil your fun, I promise. A lot more can be written about Quicksilver, but in order to make sense it would have to be clad in scholarly clothes. This is a text that brilliantly epitomizes maximalism (as do Thomas Pynchon’s novels and, I’d imagine, David Foster Wallace’s). One might argue that most of it is superfluous; another might say that none of it is. The overflow of details and the deliberate metaphorical richness – these provide a structure that is more life-like than the necessary artificiality of most novels. Quicksilver thus fulfills masterly one of its goals: to evoke the period immersively and in high definition. I believe it is very successful in its other grand ambition: to chart the world of ideas that move human actors like insignificant beakers, thus shaping history. And hey, it is just the first part of a trilogy! From my experience with Mr. Stephenson’s books, it is bound to get even better. This entry was posted in Book Reviews and tagged adventure, Big Novels, computer science, cryptohistory, epistolary, historical fiction, London, mathematics, maximalism, metaphysical, Neal Stephenson, spies.